1. To defeat an infectious disease, you must control its transmission. The Battle Against Infectious Disease. To control killer diseases like plague, typhus, malaria, and cholera, it is necessary to prevent their being communicated from infected people to healthy ones. 2. Biological warfare programs open Pandoras box. Bioweapons. Any effective bioweapon must be easy and safe to produce, practical to disperse, and do its job (that is, be lethal or incapacitating, depending on the bioweapon). Germ Warfare. For several decades the United States and Russia carried out extensive bioweapons programs. The American program was discontinued in 1969, but the Russian bioweapons program continued for another two decades. A Closer Look at Anthrax. Anthrax is a lethal infectious disease spread as spores. Weaponizing anthrax spores involves considerable technology. A Closer Look at Smallpox. Smallpox, one of historys greatest killers, was eradicated from earth in 1980. However, there was extensive bioweapons development of smallpox in Russia in the 1980s, and samples kept for research preserve the threat of future release. 3. Future threats may involve novel pathogens. Declaring Biowar on Crop Plants. The spores of pathogenic fungi that attack corn or wheat might be effective bioweapons directed against key American crops. The Nightmare of Gene-Modified Pathogens. Inserting human genes into infectious pathogens may produce lethal bioweapons against which there is no defense. Humanitys ongoing battle with infectious disease stretches back as far as recorded history, and involves many kinds of protists, bacteria, and viruses. Often disease has had a major impact on history. 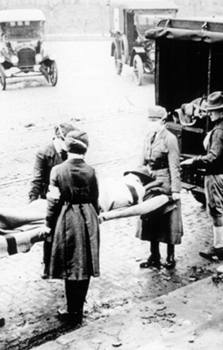 The flu epidemic of 1918 (figure 1) killed 20 million people worldwide, more than died in the World War which preceded it. With the success of antibiotics in treating bacterial killer diseases like typhus and cholera, many of us have been lulled into thinking that the battle against disease has been won. However, with the advent of antibiotic-resistant strains, many diseases like tuberculosis are making a comeback. In addition, the new century has seen the introduction of a new and more deadly way for disease to spread — by the deliberate actions of terrorists. The anthrax attack on America in 2001 has left no doubt about the reality of the threat of bioterrorism. In this chapter we examine this harsh and regrettable reality. The influenza epidemic of 1918 killed 20 million in just 18 months. With 25 million Americans alone infected during the influenza epidemic, it was hard to provide care for everyone. The Red Cross, seen here with masks over the faces of the nurses, often worked around the clock.